At this stage - we can only ship to addresses in Australia. Sorry - dealing with export taxes is beyond us at the moment. 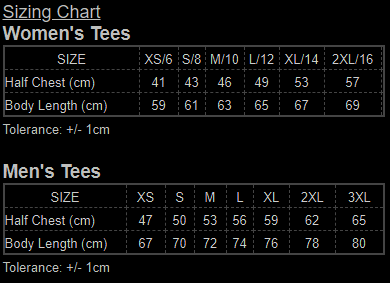 Be careful to check the sizing chart below for our tees. We're gearing up for next year's festival in May - get excited! OK - other things: We're a registered charity with the Australian Charities and Not-for-Profit Commission. Our ABN is: 90 110 689 353 and we're registered to charge GST. You'll get a copy of your tax invoice with the item once it is shipped to you.